Sure. 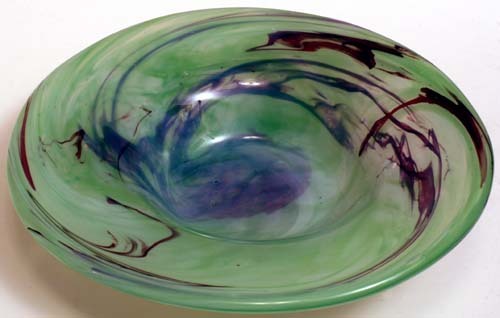 First, though, let me identify the photo above – I made that glass bowl at our glassblowing studio a few weeks ago, and it is currently my favorite of my pieces. 1. When I was a little kid, and my Dad’s sailboat was tied to the buoy with the sail fastened down, I would lie on top of the boom with my legs wrapped around it, reading. In the wind the boom would slam back and forth, but I held on tight, and I never lost my page. This terrified my mother, who was convinced that I would fall off and hurt myself. Needless to say, I was fine. 3. I am the one who carried my youngest brother home from the hospital. He’s about 14 years younger than I am, and sometimes I feel I’m more like his wacky young aunt or second mother than his big sister, since we didn’t exactly grow up together the way I did with the older of my younger brothers. 4. I once went bungee-jumping, and sometimes, when I close my eyes, I can still feel the wind in my face and the terror and delight of what it is to fly. 5. I didn’t go to law school because I necessarily wanted to be a lawyer. I went to law school because I thought it would be a fun way to spend three years of my life. I was right. 6. I have a lot of foods I don’t really like – most whole nuts, most mushrooms, oranges in most circumstances, very smelly cheeses, and more. But when I go out to a great restaurant and order a tasting menu, I only tell them my shortlist of things I hate and will never be brave with at all: peanuts, and anything that tastes like licorice (including fennel and anise). I’m tagging: Homesick Texan, Feisty Bento, La Tartine Gourmande, My Korean Kitchen, Bron Marshall, Beyond Salmon, and Hungry in Hogtown. Thanks for making the exception Danille – and I’m glad you did! That bowl is absolutely awesome, and I know exactly what you mean about doing something becasue you think it will be fun. I agree that is so important. I guess that’s why I always end up going off in different directions, because I do what I fins interesting and not what I feel I’m supposed to. Imagine how boring that would be! Great post. but this bowl is also fabulous. LOVE, LOVE, love the bowl! – Super! Fun post to read—thanks for sharing! I don’t like anything that taste like licorice either! That last item is extremely impressive! I am posting while trying to finish up my Master’s and begin my PhD. My food blog recently suffered an unintended two month hiatus. Congratulations on working damned hard and still managing to post (interesting topics at that)! i love the bowl, what a nice post. Helen – Exactly, avoiding boredom is key. Karen, Bron, JEP, ice – Thank you! Bea – I look forward to reading yours. Sarah – You know how it is, then. I actually think it’s easier to get things done if you diversify such that everything stays interesting, though. Mrs. W – Thank you, and you’re welcome. So glad that you’re enjoying them!